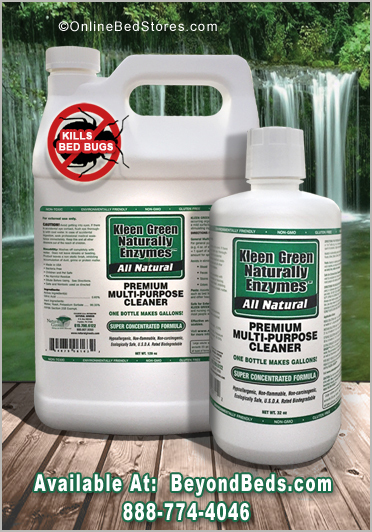 Get rid of bed bugs using a natural enzyme biological bed bug killer. It is impossible for Bed Bugs to develop a resistance to enzymes used as a method of controlling them. Bed bugs are made up of a high concentration of proteins, certain organic enzymes will cause a bed bug to molt (shed its outer coating) prematurely. During this molting phase the bed bug is at it’s most vulnerable making the bed bug susceptible to drying out or drowning since the hard shell or cuticle that normally protects the bed bug has been cast off or removed. The solution to cracking the cuticle of a bed bugs exoskeleton was discovered through the observation of insect entomology. Insects employ enzymes to escape their exoskeletons. By utilizing cultured enzymes that mimic those found in nature, a natural form of biological pesticide can be produced that has the ability to dismantle the armor of an insect instantly. Enzymes digest insect’s waxy cuticle on contact and dismantles their exoskeleton – effectively forcing insects into immediate molting in which the protective shell is stripped. Using enzyme-based formulas as a biological bed bug killer is an ingenious play of engaging the forces of nature to our advantage. Enzymes exist throughout the insect, plant and animal kingdoms to aid in the digestion of organic matter. Arachnids such as spiders and scorpions inject their prey with enzyme; insect larvae (maggots) also rely on enzymes to predigest their food for them. Insectivore plants also use enzymes to digest insect prey. Even cellular organisms such as bacteria, mold, mildew and yeasts all depend on enzymes to aid in the external digestion of food sources. Enzymes play a fundamental role to all life because they are a necessary catalyst to speed up the chemical reaction of metabolism. Enzymes are used by living beings to break down complex structures in food digestion. Enzyme control of insects is preferable to traditional pesticide-based approaches to pest control for several reasons, not least of which is the elimination of chemical exposure risk. Enzyme control as a bed bug killer is non-toxic and safe for people and the environment, pesticides are not. Enzyme is a desirable alternative to pesticide control because it relies on physical biology rather than on toxic substances to achieve success. Enzyme control is universal in range – all insects are affected by enzyme – enzyme works for any pest problem encountered.